Whether worn as your primary head protection or underneath a great helm, you cannot beat the benefits of a close fitting skull cap like the Rufus Steel Helmet. This helmet style was worn by medieval Crusaders and common folk alike. Also called a cervellier, this steel helmet features a rounded dome shape with a central ridge across its skull that ends in a gentle point. Two rows of rivets decorate the slightly extended back, designed to help protect the neck. 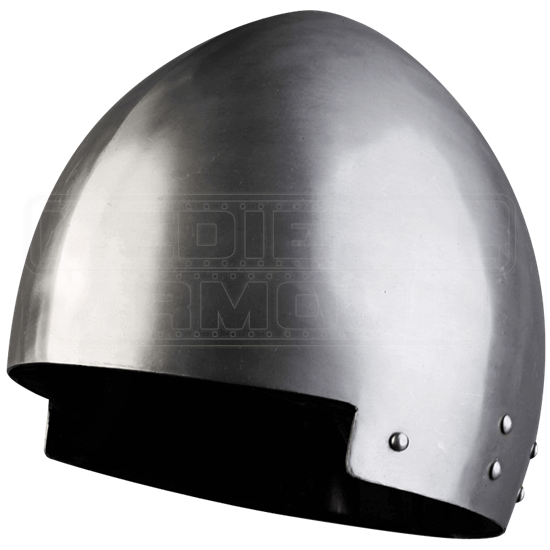 This handmade steel helmet has an inner cotton covered foam lining, but we recommend wearing it over a padded arming cap for proper comfort and safety. Commoners and non-professional soldiers often wore this style as their chief headwear because it was easy to obtain, while higher classes and those who battled more often usually wore it underneath a larger helmet or chainmail coif. This steel skull cap has a leather chin strap to help secure it to your person. Whatever your medieval or fantasy character, add extra protection and style to your armour costume with the Rufus Steel Helmet.